The Computer & Communications Industry Association, which represents companies like Amazon, Facebook, Google, Intel, Microsoft and Samsung lodged a formal a letter in opposition to Qualcomm's ITC request on Thursday, Reuters reports. In the filing, the CCIA argues that Qualcomm's attempt to stop Apple from importing foreign-assembled iPhones using Intel chips would cause "significant shocks to supply" for the greater smartphone market. Earlier this month, Qualcomm lodged an ITC complaint requesting an import and domestic sales ban on iPhone and iPad models produced outside of the U.S. Specifically, the chipmaker's proposed exclusion order applies only to handsets which contain wireless modems made by Intel. An accompanying patent infringement suit was leveled in concert with the ITC complaint. Apple first began sourcing modem components from Intel last year. It is estimated that about 30 percent of current iPhone 7 models incorporate Intel parts, with the remainder sourced from Qualcomm. Recent rumors suggest Apple is looking to further diversify its supply chain and will incorporate Intel modems in 50 percent of all iPhones made in 2017. 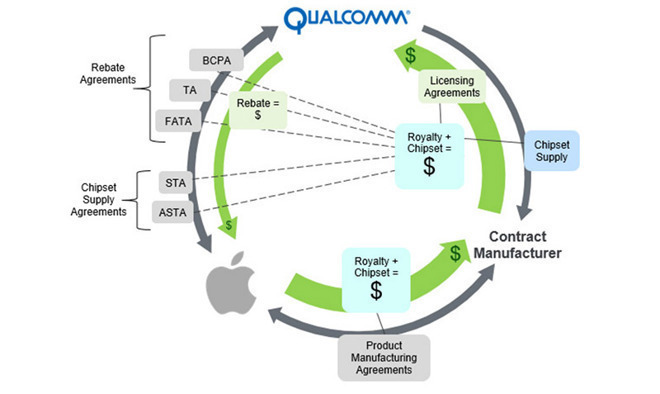 "If the ITC were to grant this exclusion order, it would help Qualcomm use its monopoly power for further leverage against Apple and allow them to drive up prices on consumer devices," said Ed Black, President and CEO of the CCIA. "What's at stake here is certainly the availability of iPhones and other smartphones at better prices." The CCIA comment comes amidst a quickly escalating legal battle between Apple and Qualcomm. In January, Apple sued its longtime partner for allegedly "abusing its "monopoly power" to demand higher than normal royalties and force chip buyers to sign onerous patent licensing agreements prior to purchase. The tech giant also claims Qualcomm withheld almost $1 billion in rebates in retaliation for Apple's willing participation in a South Korean antitrust probe. Qualcomm fired back with a countersuit in April, claiming Apple's litigation is a ploy to garner favorable licensing fees. In May, the chipmaker lodged another lawsuit seeking a court order to force Apple suppliers to pay owed royalties. The firm alleges Apple directed contract manufacturers to halt such payments until the legal battle concludes. In response, contract manufacturers Foxconn, Compal, Wistron and Pegatron, with backing from Apple, on Tuesday filed an antitrust suit against Qualcomm claiming violation of two sections of the Sherman Act. A day later, Qualcomm lodged a pair of patent infringement suits against Apple in Germany using IP from same batch of six patents leveraged in the ITC complaint.